Antalya Old Town, Kaleici Antalya, meaning “inside the fortress” in Turkish language, is the old town center of the city located by the sea between Konyaalti beach to the west and Lara beach to the east. The history of Kaleici goes back to the Roman period with the Hadrianus Gate, Roman Harbour, Hidirlik Tower and the walls surrounding the town whereas the picturesque old Turkish houses, narrow streets, minarets and mosques show us the Seljuk and Ottoman face of the town. Kaleici is a very nice place to wander around with the Yivli (fluted) minaret, Saat Kulesi (Watch Tower), Hadrianus Gate, shopping street on the way to the harbour, Kesik (cut) Minaret and the ruins, Suna-Inan Kirac Kaleici Museum and Hidirlik Tower where you can sit at a cafe and watch the spectacular scenery of the Antalya coast. Hadrianus Gate (Uc Kapilar), a Roman structure dating back to 130 B.C. is one of the symbols in Antalya. It is a well-kept histroical building as well as it is known as the best gate of Pamphilia. Originally built as two floors, the gate has two towers on each side. The one in the South is called Julia Sanctra and remained from the Roman period. The upper parts of the one in the North remained from Seljuk period. 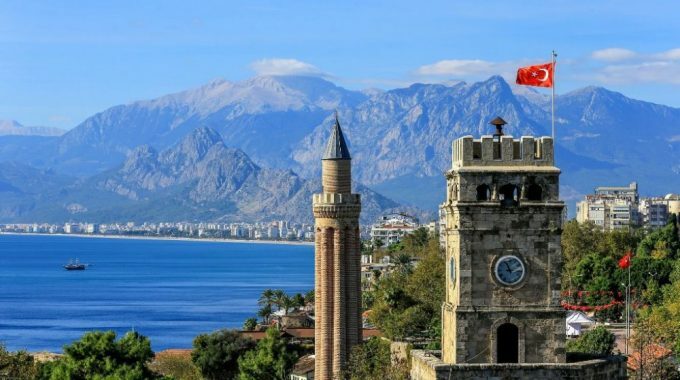 The gate is a not only one of the thousands of ruins in Antalya but also a point showing the old city and the modern city in one place, which there are many places to see this difference in Antalya. Yivli Minare, one of the symbols of the city with eye-catching height means the fluted minaret in English. Yivli minaret belongs to the Ulu Camii complex located near the old town center (Kaleici) in Antalya. It was built on a square stone base and it is 38 metres high with 8 pieces of semi-cyclindrical shape sections and 90 steps to the top. Turquoise and dark blue colored Allah and Mohammad words are written to every direction of the floor. Yivli Minaret is one of the first Islamic buildings in Antalya that was built in 1230 on an old Roman Orthodox church during the reign of the Seljuk sultan Alaaddin Keykubat I. Today it is one of the symbols and landmark of the city with dark blue and turquoise tiles and red bricks. It also housed the Antalya Ethnographic Museum opened to the public in 1974. Hıdırlık Tower in the old town near Karaalioglu Park is one of the landmarks of the city. It was built in Hellenistic era on a square plan and probably used as fortification or lighthouse. It’s worth seeing because it is located in one of the nicest parts of the city for a wonderful view of the port, gulf, beach and the Bey Mountains outside the city or drinking something cold at the cafes around or going for a walk at the park and take panaromic photos of the city. Getting there is very easy. Enter the old town through the histocial Hadrianus gate on the main road, walk down the narrow streets towards the sea.